Led by Byzantine specialist, this tour takes participants on a journey into the soul of Byzantine history and culture, opening doors and setting light on an ancient and great empire. Much of the remnants of the Byzantine Empire have to be sought out; sometimes it takes a specialist’s eye to spot the wall, the church, or the fountain to then be related to the written records. We are proud to offer a tour that will lead the small group of participants to a greater understanding of Byzantine history, as they walk in the very footsteps of the Byzantines themselves. Guests are met by a member of Peten Travels at Atatürk International airport and assisted through transfer and check-in to this historic hotel. The small group of participants will meet each other and key staff over a welcome drink before sitting down to a group dinner. After breakfast we set off to begin unpeeling the layers of Byzantine history. Our first stop is The Hippodrome, one of the most famous monuments of Byzantine Constantinople. Many of the great events in the history of the Byzantine Empire took place here. The triumphs of victorious generals and emperors were celebrated in this wide expanse, but its primary function was as a sports center, where the regular program of chariot races and circuses served as a diversion for the people for more than a thousand years. The Church of SS Sergius and Bacchus (Küçük Aya Sofya Cami), is one of the most beautiful and historic of the surviving Byzantine churches in the city. 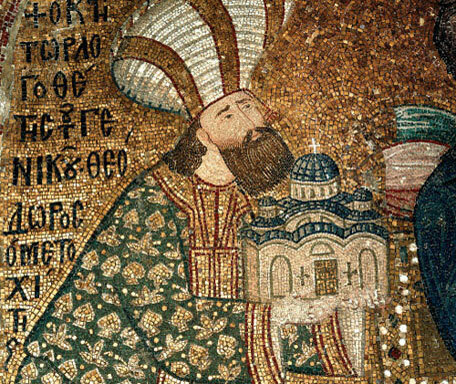 Justinian began construction on the church in 527, the first year of his reign. He dedicated the church to SS.Sergius and Bacchus, two Roman soldiers martyred for their faith and later the patron saints of Christians in the Roman Army. The Palace of Bucoleon looked down upon the Harbor of the Bucoleon, a small port used by those living in the Great Palace. The statues of two lions guarded the port. Only three great marble-framed windows in a recess in the walls now identify this spot. The Great Palace Mosaic Museum, the residence of the Byzantine emperors and the setting for lavish ceremonials, is today better captured from the texts than from the archaeological remains. 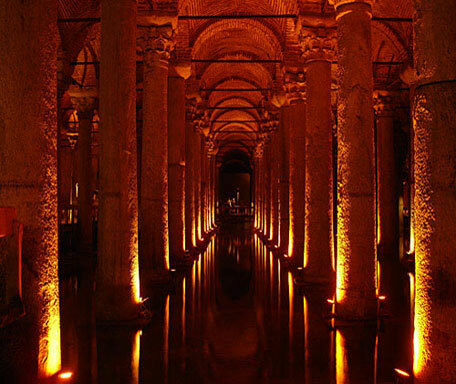 We continue to explore the early imperial city by visiting The Basilica Cistern, by far the largest underground cistern in the city. It was built, by Justinian after the Nika riots, to extend the water supply because, as Procopius tells us “in the summer season the imperial city used to suffer from scarcity of water as a general thing, though at the other season it enjoyed a sufficiency”. The Church of the Pammakaristos, the Joyous Mother of God, is known locally as Fethiye Cami. This is one of the most beautiful of the Byzantine churches with superb external brickwork and mosaics. John Comnenus and his wife Anna Ducaena built the church in the early 12th century. This church was the seat of the Patriarchate for over a century after the conquest. The Church of the Pantocrator (only the exterior and environs) known as the Zeyrek Cami, is a composite of buildings that originally consisted of a monastery with two churches and a chapel between them. It was a very extensive foundation, including a hospice for old men, an insane asylum, and a famous hospital. 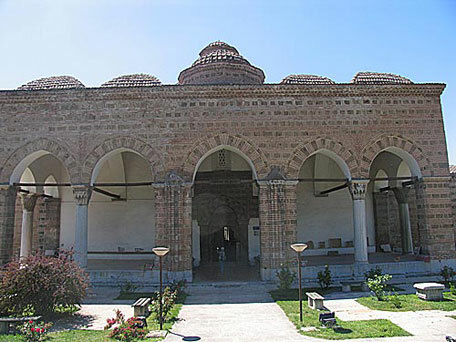 The Church of Constantine Lips is known locally as Fenari İsa Cami, (the Mosque of the Lamp of Jesus) dating from the 10th century. Constantine Lips Dungarious, a commander of the Byzantine fleet, founded this monastic church, dedicated to the Immaculate Mother of God. The Church of St. Stephen of the Bulgars was built in 1871 in a bold neo-Gothic style as a statement of Bulgarian independence from the Greek Patriarchate. It was constructed entirely of cast iron and shipped piece by piece from Vienna down the Danube, into the Black Sea and along the Bosphorus. The Greek Orthodox Patriarchate has been on this site since about 1601, having moved around for a number of years after leaving the Pammakaristos in 1586. The present patriarchal church of St. George is from the 18th century. St. Mary of the Mongols has the unique distinction of being the only unconverted Byzantine church in Istanbul and the only Byzantine sanctuary continuously in the hands of the Greeks since before the Turkish Conquest. This morning we visit the Kalenderhane Cami, a large and handsome Byzantine church. The building underwent a thorough archaeological investigation and restoration by the Dumbarton Oaks Society who identified it as that of the Kyriotissa and dated it to the middle of the 9th century. 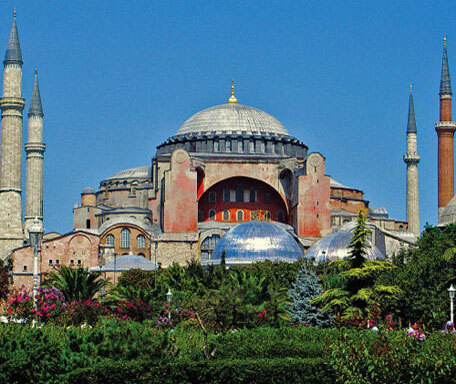 Haghia Sophia (Church of the Divine Wisdom) is one of the most extraordinary buildings in the history of architecture, and a monument to the golden age of the Byzantine Empire. Some of the most important events in the history of Byzantium are connected with this venerable edifice, and it played such a central role in the life of the city that it has become the enduring symbol of Byzantine Constantinople. In the afternoon we stroll through the old district of “Pera & Galata” and visit the Arap Cami in Karaköy quarter. It was built in 1325 by the friars of the Dominican Order near or above a former 13th century Roman Catholic chapel, devoted to Saint Paul. 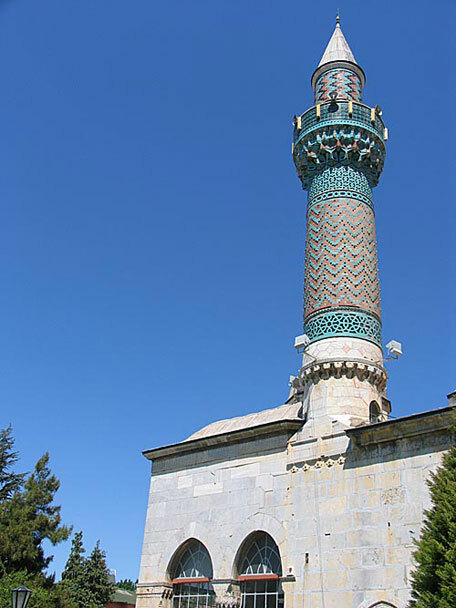 Although the structure was altered during the Ottoman period, it represents the only example of religious Gothis Architecture remaining in Istanbul. 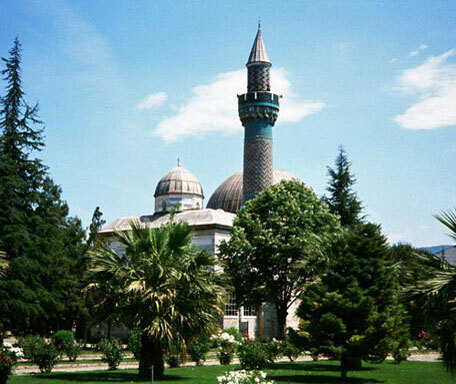 St. John of Studius (Imrahor Cami) was founded in 463 by a Roman patrician called Studius. Every year on the holy day to mark the beheading of St. John the Baptist (29th August), the Emperor would come by sea to visit the church that claimed to possess the Baptist’s head. This is the oldest church in Istanbul and the only example of a pure basilica. The Walls of Theodosius, the triple fortifications of the city on the landward side, extend for 7 kilometers from the Sea of Marmara to the Golden Horn. These defenses were stout enough to ensure the safety of the city until the arrival of artillery in the 15th century. 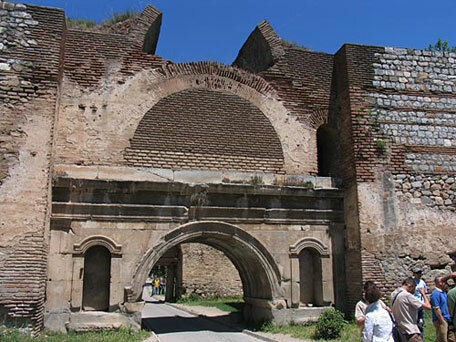 The Golden Gate, located between the two central towers of the Theodosian wall, was built by Theodosius I in 390 to celebrate his victory over a usurper from the Empire of the West. Yedikule or The Seven Towers includes 4 towers from the Theodosian Walls and 3 towers added by Mehmet the Conqueror together with a connecting curtain wall. The Palaces of Blachernae & Porphyrygenitus: The Tekfur Saray, (Palace of the Porphyrygenitus), is tucked between the inner and outer walls of the Theodosian defenses. The palace was probably built in the late 13th century or earlier as an extension of the adjacent Blachernae Palace. This was a rectangular building of three stories, built in a mixture of brick and stone to make a striking polychrome design. The Comneni enlarged the Blachernae Palace in the 12th century. The Church of St. Saviour in Chora is, after Hagia Sophia, the most interesting Byzantine church in the city. 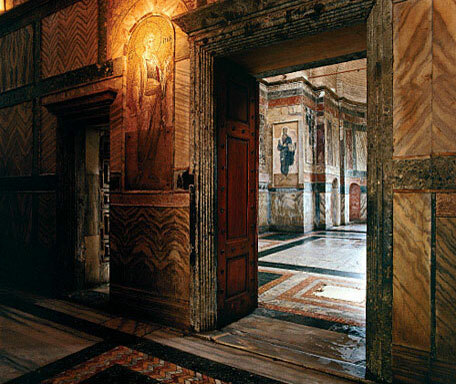 This is not due to the building itself, pretty as it is, but because of the superb mosaics and frescoes that it contains, a magnificent heritage of Byzantine art that has no equal in the world. The Aqueduct of Valens was built by the emperor in 375 A.D. The stones reputedly came from Chalcedon, sacked due to a rebellion against the emperor. The Aqueduct served the city for 1500 years. After breakfast we take the fast ferryboat for Nicaea (İznik). Once we arrive at this wonderfully walled town, we visit the Church of Haghia Sophia, the most important Byzantine monument in Iznik. Built by Justinian in the 6th century, an earthquake in 1065 led to its total rebuilding. This church, the one visible today, served as the Cathedral of the Empire of Nicaea and the venue for Imperial coronations. The Walls: the double line of city walls are mostly Byzantine in date, though repaired and partly rebuilt by the Ottomans. The Archaeology Museum: The Nilüfer Hatun İmareti (charity foundation complex) was built in 1388 by Murat I and his mother, a Greek princess, daughter of the Emperor John VI Catacuzenos. In 1346 Theodora or Nilüfer Hatun, as she became known, married Orhan Gazi, while being allowed to remain a Christian. The building provided food for students and lodgings for itinerant dervishes. It has been well restored as a museum. We stop at the Iznik Foundation for a lecture on Iznik Tiles and visit their ateliers. Overnight in Nicaea. After breakfast we return to Istanbul by ferry and spend the rest of day at the Archaeological Museum of Istanbul. The exhibit “İstanbul through the Ages” opened recently. This includes much of the material once displayed in the Byzantine gallery that has been closed for more than a decade. Items in this exhibit being displayed include the 13th century St. Francis frescoes from the Church of Theotokos Kyriotissa, the 10th century inlaid marble icons from the Church of Theotokos tou Libos, and the early 6th century sculptures from H. Polyeuktos. We spend a leisurely afternoon before we leave for our farewell dinner. Participants are transferred back to Atatürk International Airport to connect with their return flights. Moderate walks. Comfortable and good footwear is essential. Please bring a pair of binoculars to examine the fine mosaics in the Byzantine churches. We will be visiting churches that are not open to the public. All ground transportation by a/c, modern mini / midi bus with fridge, reclining seats, wide windows.